Unleash the power that's hidden within your GTI [MK7] from the palm of your hand. 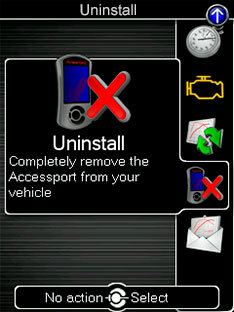 This AccessPORT V3 is quick and easy to uninstall so you can revert your ECU back to how it was before. 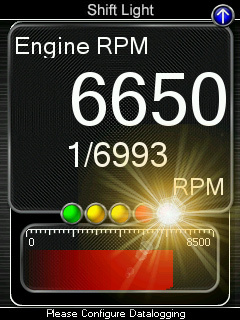 The shift light feature will setup a custom RPM warning light so you get a perfect shift everytime. The Cobb AccessPORT V3 gives you a huge power increase with the ability to finely tune your vehicle, giving you the best tune possible. This Cobb AccessPORT V3 unleashes the hidden power within your Golf GTI [MK7] by taking off the restrictive factory settings and software. 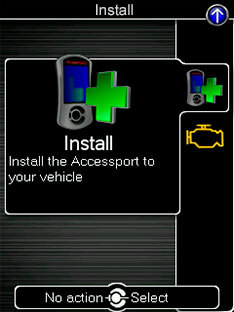 This AccessPORT plugs directly into your OBD port and flashes your VW's computer (ECU) in a matter of minutes to optimize your vehicles performance. 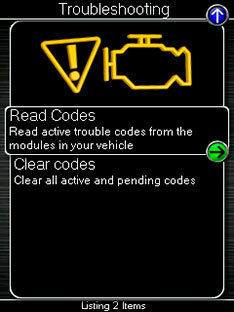 This tune is an ECU flash, not a piggy-back tuner, there will be no added device to your vehicle's ECU. Stage 1: Stage 1 at 93 Octane will give you peak gains of +26% HP/+22% TQ, with the largest gains at +35% HP at 5500 RPM/+31% TQ at 2200 RPM. 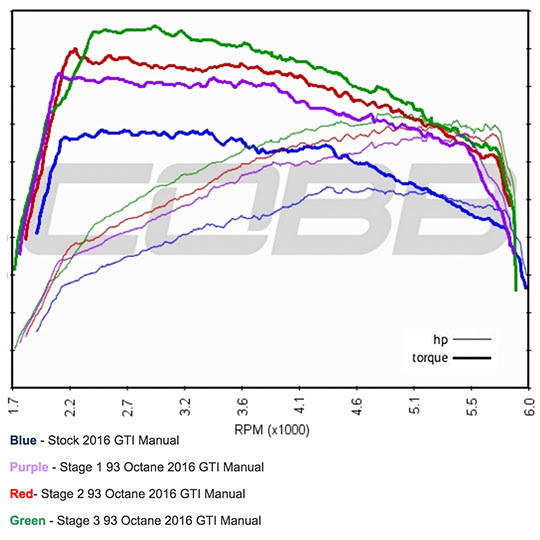 Stage 1 hardware consists of Cobb AccessPORT V3 and Cobb's High Flow Filter. Stage 2: Stage 2 at 93 Octane will give you peak gains of +30 HP/+31% TQ, with the largest gains at +41% HP at 5730 RPM/+37% TQ at 2250 RPM. Stage 2 hardware consists of Cobb AccessPORT V3, SF Intake System, and AMS Performance Front Mount Intercooler. Stage 3: Stage 3 at 93 Octane will give you peak gains of +37% HP/+41% TQ, with the largest gains at +46% HP at 5730 RPM/+41 % TQ at 3050 RPM. Stage 3 hardware consists of Cobb AccessPORT V3, SF Intake System, AMS Performance Front Mount Intercooler, and GESI Catted 3" Downpipe. The screen has been super sized for ease of use and better monitoring. Full text help menus, multi-gauge layouts, full map descriptions and more. This screen has room to spare - so no need to run back to your laptop. 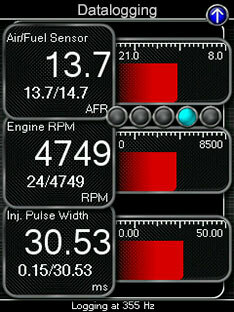 The V3 now supports up to 6 fully customizable gauges with 1/1000 resolution. 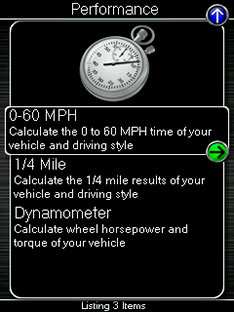 Monitor all the parameters you want to see and customize each layout for street, strip or track. With the on/off button and using the included universal mount or vehicle specific options, there is no reason not to run your AP in-vehicle. 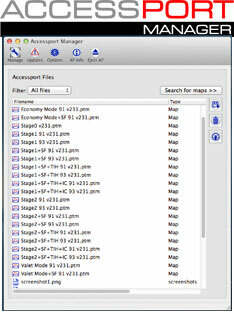 Use your same maps, monitor your same parameters, and troubleshoot your same codes, but now with more. 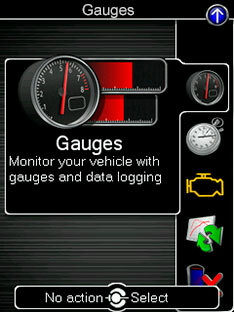 More speed, more memory, more map storage, more live gauges, and more troubleshooting help.